Latching onto yet another nickname for the human female breast and the human male's inability to function properly in its presence, upscale bowling establishment Bowlmor Lanes where President Nixon and the Rolling Stones have appeared has an ad that gets right to the heart (breast?) of the matter. yes, we're thinking of bowling now too. - It's political ads like this that make us realize why an increasing amount of people don't vote. - Following up on its 60 Minutes ad buyout a couple years ago Philips has purchased all the ad time on this Saturday's Texas-Oklahoma State college football game on TBS. 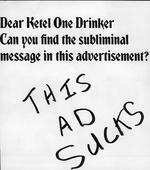 Some o the time will be used for ads. The other time will be given back to TBS for additional programming during the game. - London agency with German lineage Scholz and Friends asks visitors to weblog to not mention the war. - London agency Cake is hosting a contest for people to decide the title of the next Young Bond book. 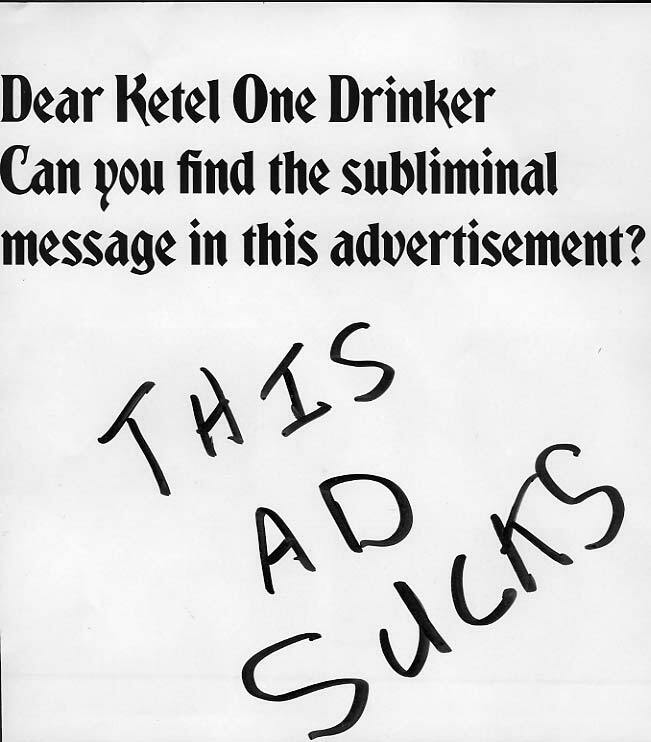 - Ketel One wants you to find the subliminal messaging in its ad. Hmm. We know there's a message in there somewhere. - Xbox360 game Gears of War gets sidewalk graffiti treatment in San Francisco. 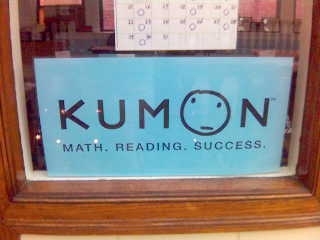 We know there's no lack of weirdos out there with get rich quick schemes but we don't think we've seen one that apparently likes to openly share his sexual preference inside his company's logo. Of course, there doesn't seem to be any problem with pediatric doctors alluding to pedophilia in their logos. 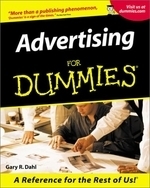 If you've worked in advertising longer than one month, you know there are some very stupid people in the business. Perhaps you are one of them without even knowing it. To see if you are, check out AdVerbatims, a site filled with choice phrases from people who think they know what they are talking about but have absolutely no idea how stupid they sound.